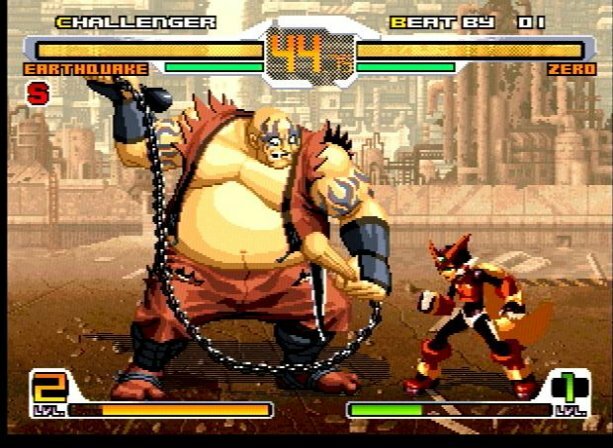 REVIEW: After SNK's original SNK VS Capcom: Match of The Millennium on the Neo Geo Pocket (1999), Capcom held up their part of the crossover deal with Capcom VS SNK (2000) and the excellent sequel, Capcom VS SNK 2 (2001). 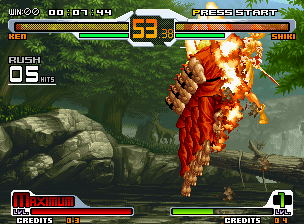 Now in 2003, it's SNK's turn once again to reunite the iconic companies in SNK VS Capcom Chaos. SVC Chaos hosts a default roster of 24 characters from both companies, with 12 additional mid-boss or "secret" characters, making for a pretty impressive and interesting roster. 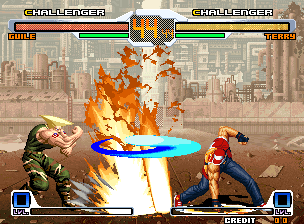 Chaos uses SNK's trademark "King of Fighters style" gameplay and graphics, which certainly brings the nostalgia to old school 2D fighting game players. 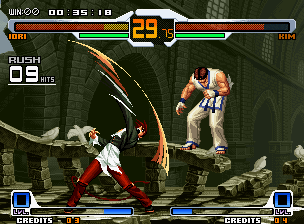 That said, SNK borrowed many character sprites from the King of Fighters series, but also created a some brand new SNK sprites for the game (such as Shiki & Earthquake). 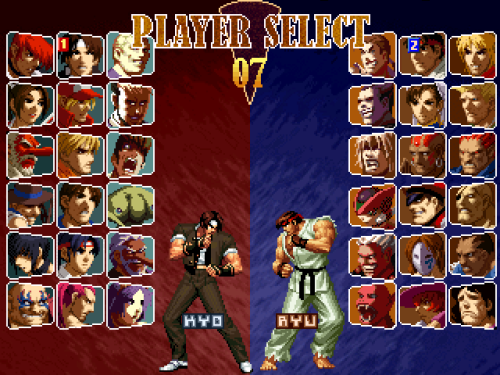 Of course, all respective Capcom characters are drawn in "KOF style" for the first time ever... and immediately mesh well with the SNK icons. 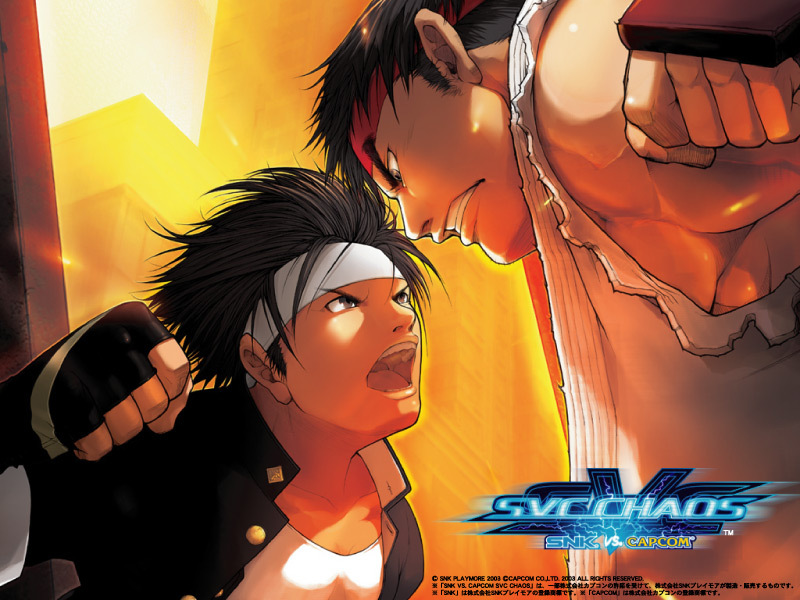 SVC Chaos's full selection screen, complete with secret characters. 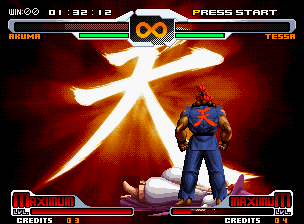 To start things off, let's be honest... SVC Chaos's graphics look pretty ancient from the start. 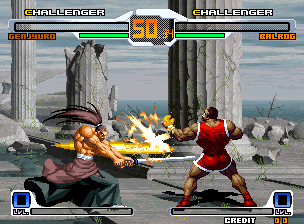 Many of SNK's characters are just old rehashed sprites... and when I say old, I mean OLD, like King of Fighters '95 old... *cough* Lookin' at you Kasumi *cough*. 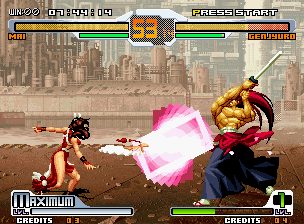 Considering many other fighting game titles of 2003 (and earlier), SVC Chaos is definitely lacking in the visuals department. 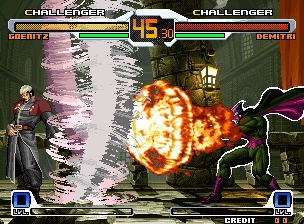 Players who thrive on "flash" in their 2D fighting games will probably be disappointed, as Super Moves many of the particle effects just don't "pop" like in other 2D fighters. 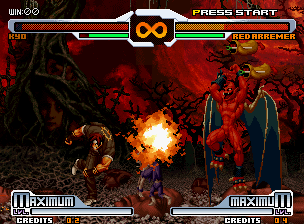 Most of the backgrounds in SVC Chaos lack color, detail, and excitement... to say the very least. 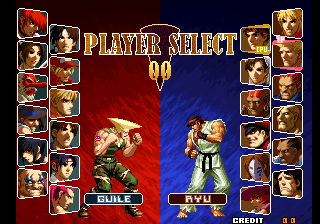 Surprisingly, no "classic" Capcom or SNK battlegrounds (or even BGMs) make the cut, which is pretty disappointing in a title like this. 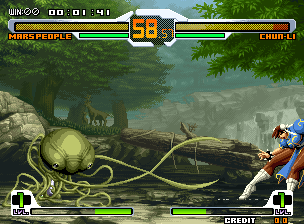 As far as character sprites go, SNK paid homage to Capcom's characters pretty well. 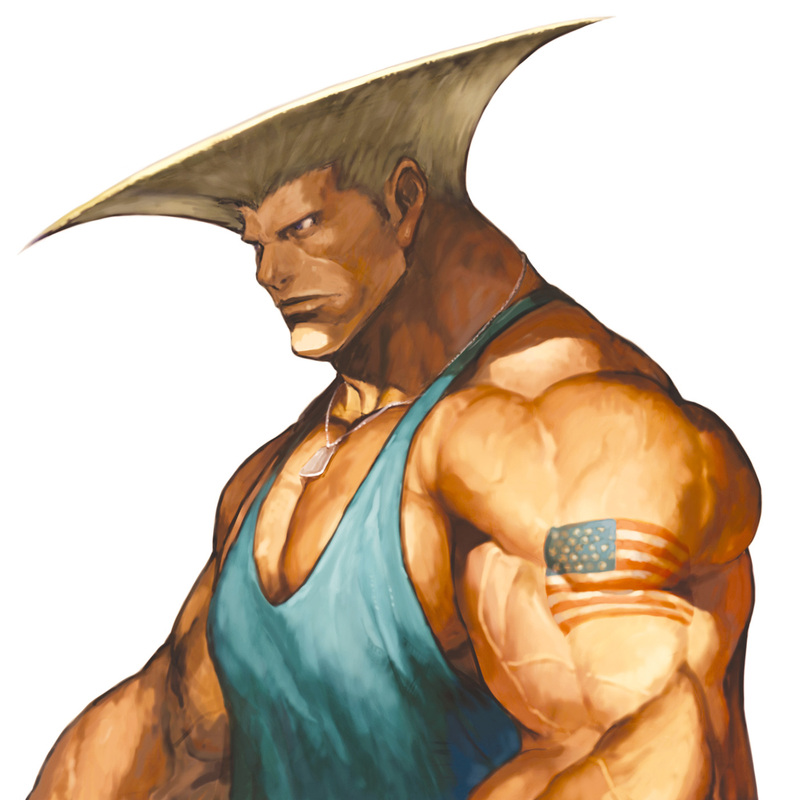 The Capcom favorites look pretty spiffy in SNK's style and are well-animated for the most part. 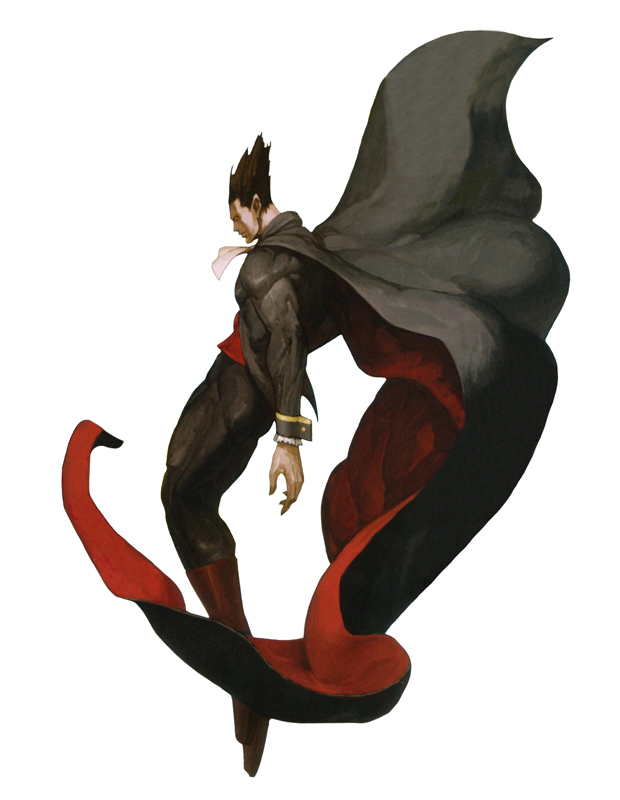 The awesome in-game artwork also does them a lot of justice! 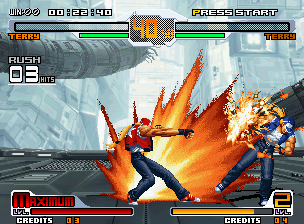 Players familiar with classic King of Fighters gameplay will feel right at home, because SVC Chaos feels very similar to the most recent KOF title, King of Fighters 2002. 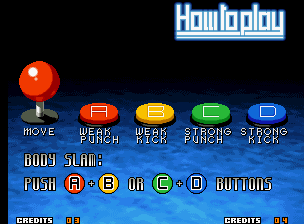 The staple 4-button layout remains the same, but the team system has been replaced with a classic 1-on-1 format. 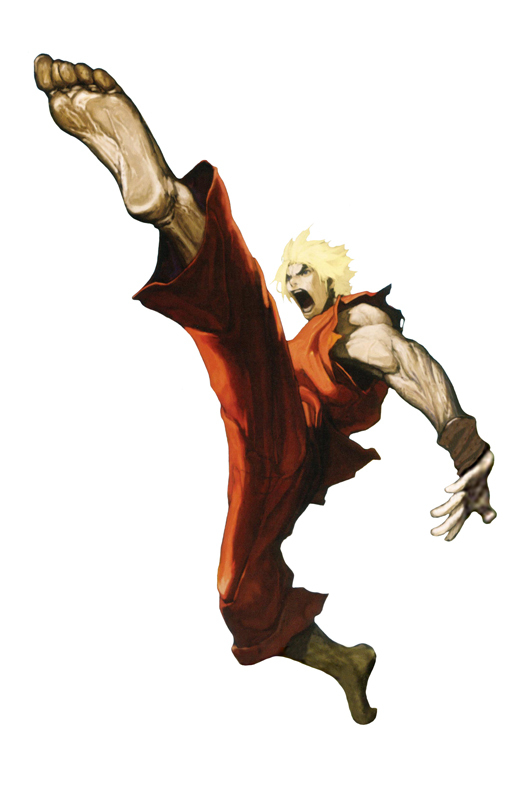 Pulling off a Shoryuken or a Yoga Flame will be easy for Capcom veterans, but the gameplay mechanics may take some getting used to, as they are slightly more "stiff" and arguably a bit faster than most Street Fighter games. 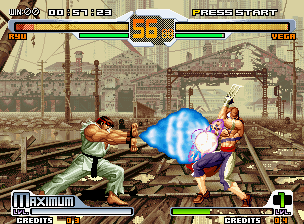 Aside from that, most of the typical KOF gameplay elements and fighting game fundamentals are in place. 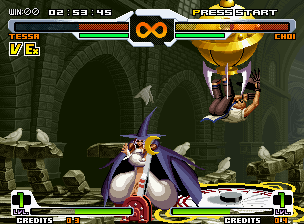 Chaos uses a "Capcom style" 3 tier Super Gauge called the Groove Power Gauge, which fills as the player attacks or guards. 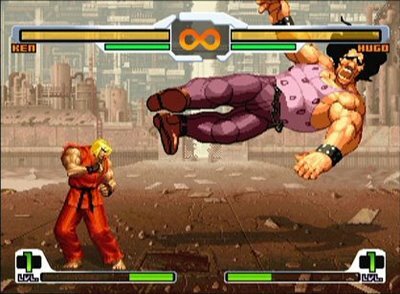 When the gauge reaches level 1 or 2, players can perform Super Moves, and use Guard Cancel Attacks or a Guard Cancel Front Step maneuvers. 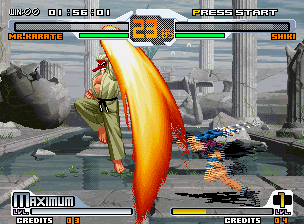 When the gauge is full, a MAX Activation occurs, turning the gauge into a timer. 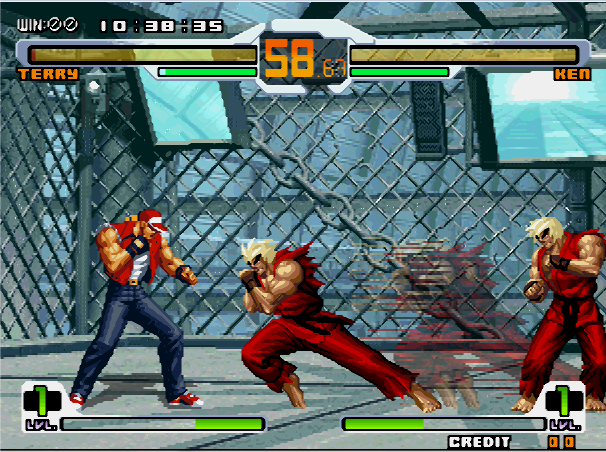 The player can then freely cancel any of their attacks, special moves, or super moves at will. 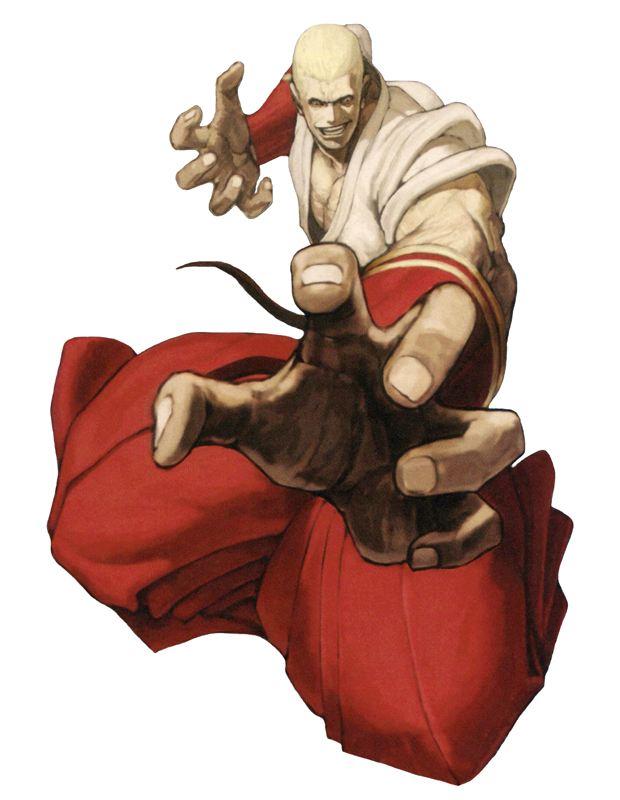 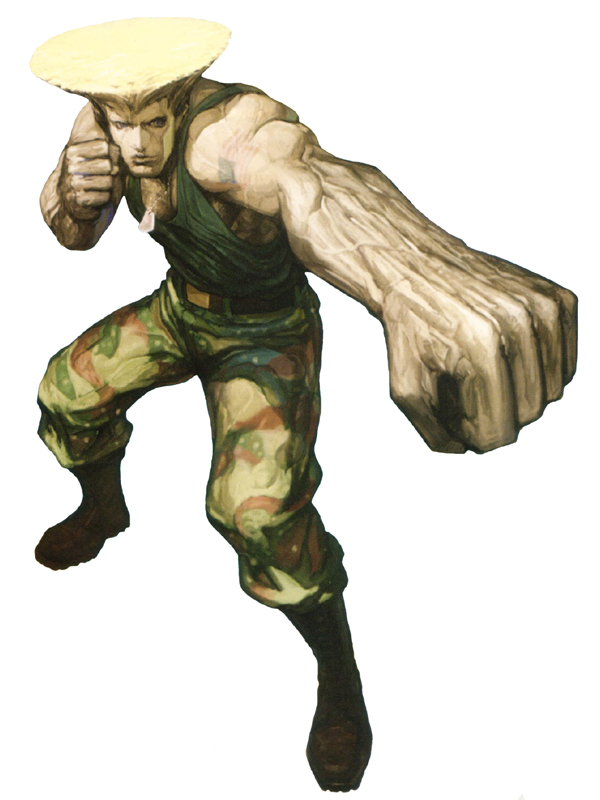 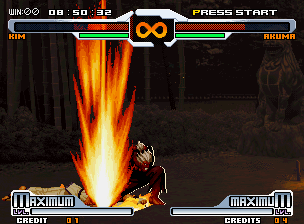 Each fighter also has an "Exceed" technique which can only be performed a single time when the player has half life. 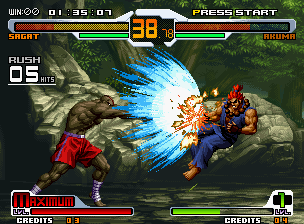 A new technique called the Front Grand Step is also in place, allowing the players to leap towards the opponent and cancel into a basic attack. 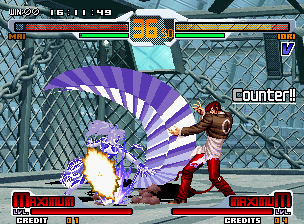 The player can perform this technique while guarding from an opponent's attack, which will consume one Power Gauge level. 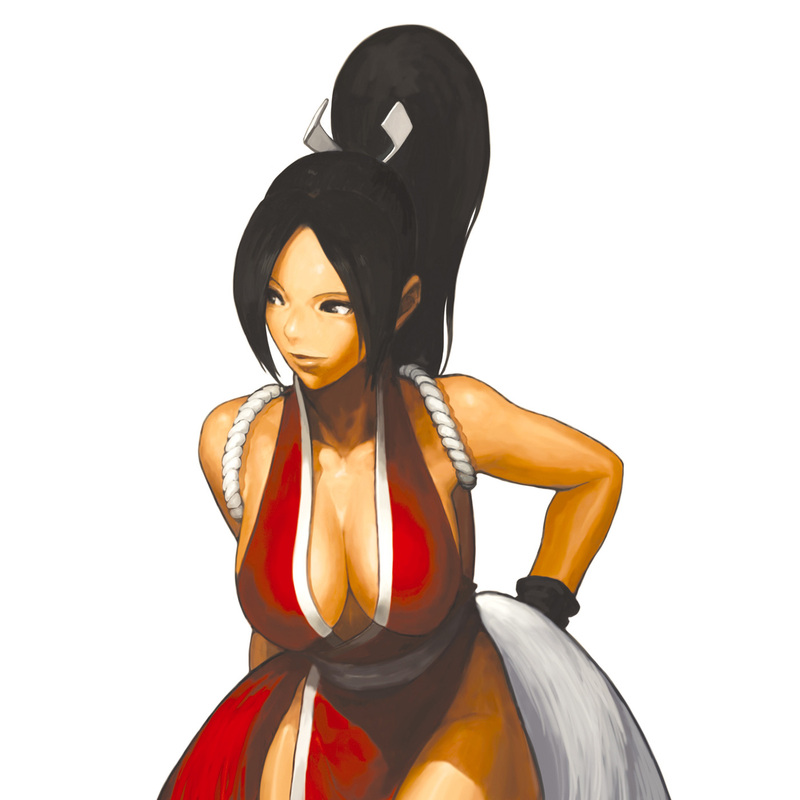 The in-game dialogue brings the fan service... and lols. 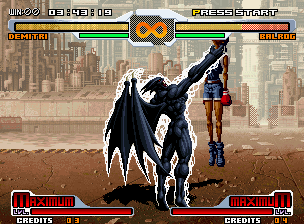 Die-hard 2D fighting gamers can definitely have some fun with Chaos, and I suppose that's whom the game is intended for. 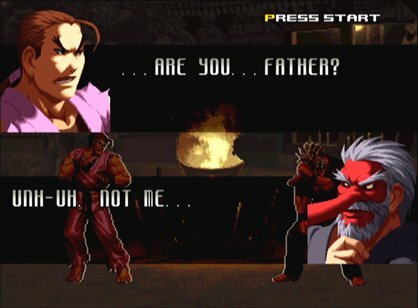 One of SVC's unique attributes is the personalized dialogue between all characters, which is something long time Capcom and SNK fans will appreciate greatly! 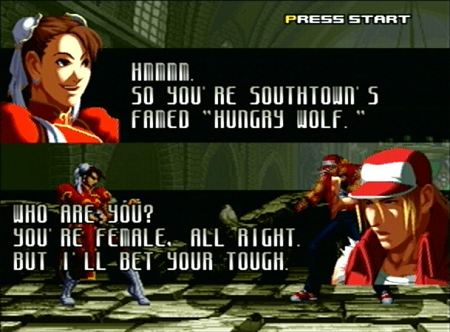 Before each battle, every character has something to say to their opponent (all of which is character-exclusive), and there are definitely some cool and funny ones to see (in addition to some other ones that make absolutely no sense due to another SNK trademark - Bad translation). 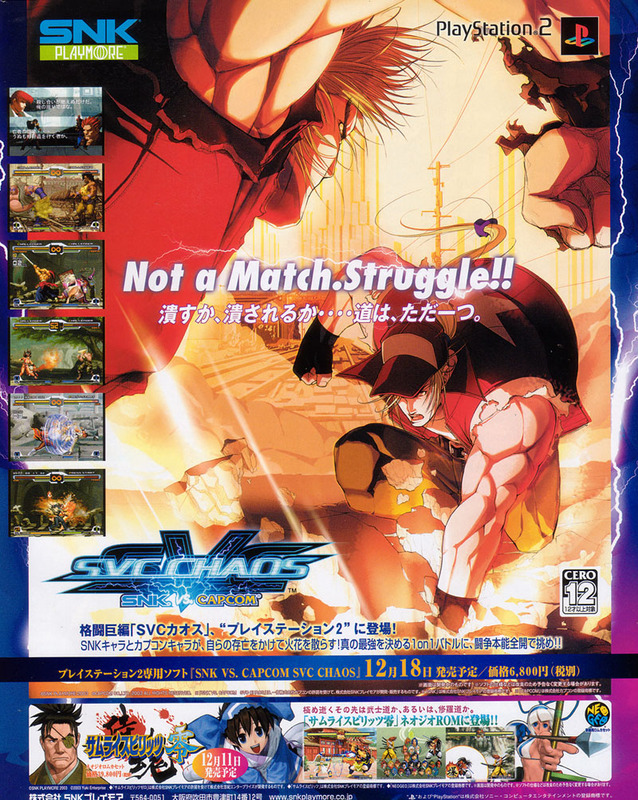 Final Words: Although SVC Chaos features a solid character roster and a badass intro, the overall package definitely seems rushed. 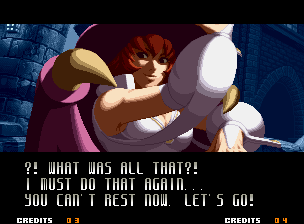 The character dialogue intermissions are an appreciated fan service, but the game just doesn't manage to impress on several levels. 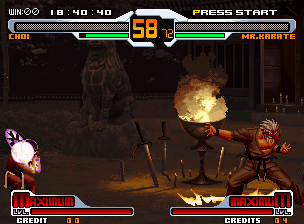 SNK should have taken more time with the backgrounds and overall visuals. 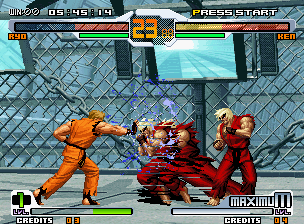 For such an epic cross-over game, I think using the graphics & gameplay engine from Garou: Mark of the Wolves would've been SNK's best foot forward. 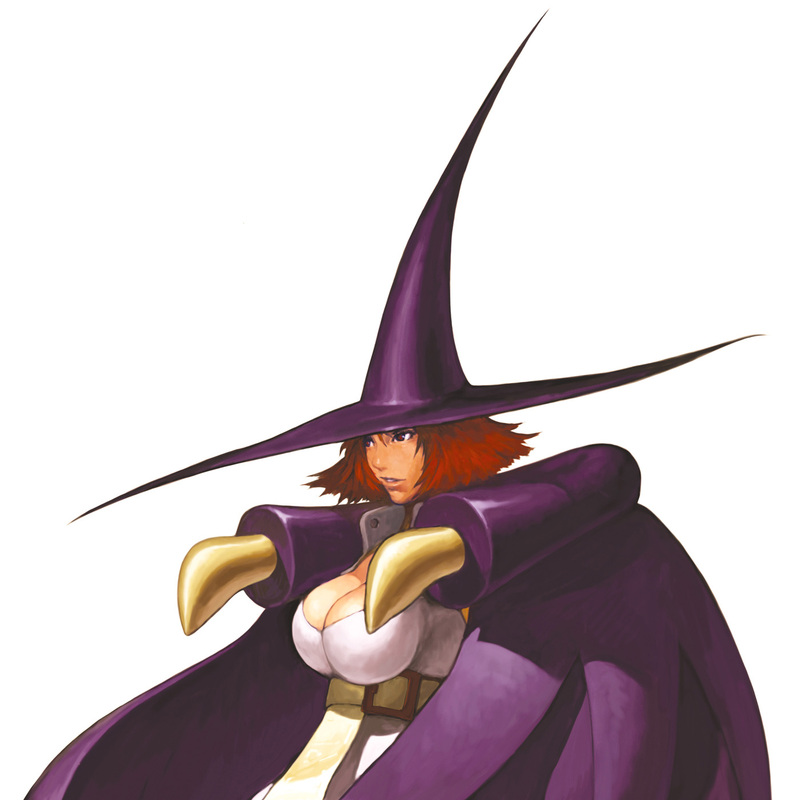 Yes, that project probably would've taken a lot more time to complete, but I think it would've been worth the wait. 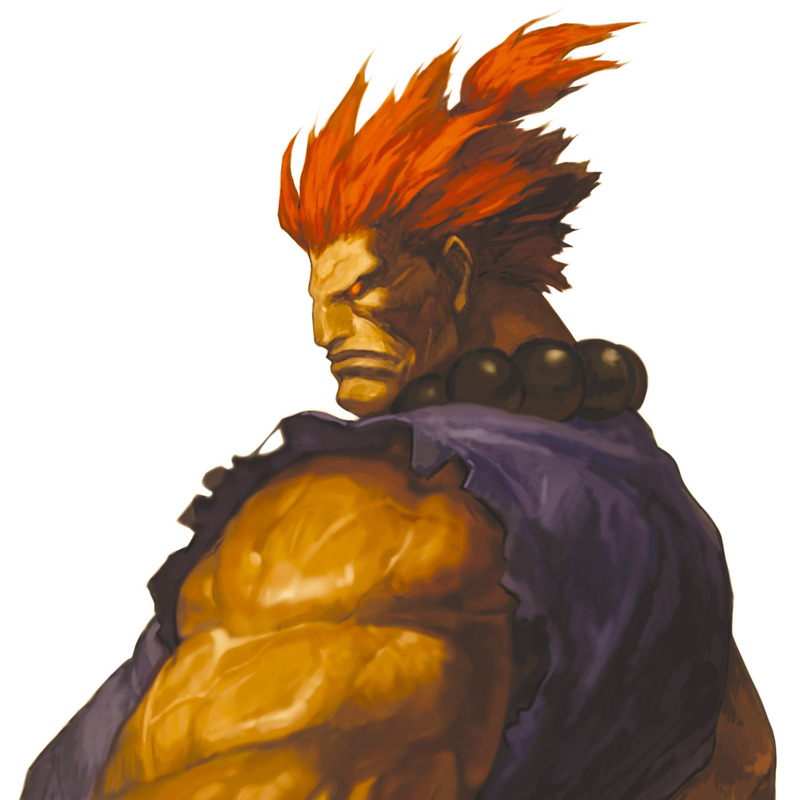 Click Here for all character busts!